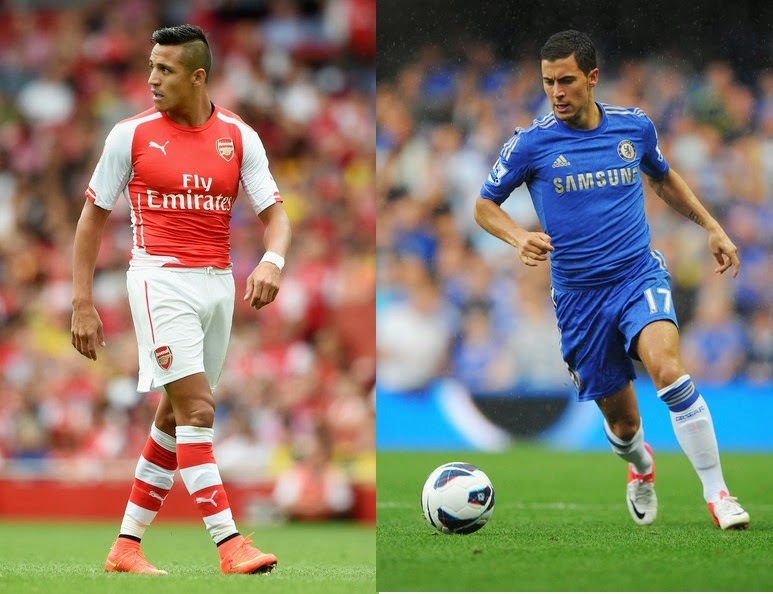 Sanchez vs Hazard: Who has started this season better? Premier League player compassion Alexis Sanchez (Arsenal) vs Eden Hazard (Chelsea): Who has started this season better? See head to head stats. When the Premier League started this season, it was thought that Alexis Sanchez will take some time as the Chilean had first time set foot on English soil. On the other end of London, Eden Hazard who was starting his 3rd year at the helm was confident to win his first Premier League title. However as it seems now, Chelsea are on an Invincible run with coming from all possible angles, Arsenal are still toiling in the mid table performances. In a team which is worn out with average performances, Sanchez is the only reason why the Gunners are within a touching distance of the 4th spot. While Chelsea have scored the most number of goals in the Premier League this season with Diego Costa spear-heading its attack, Arsenal are in 4th spot when it comes to goals scored this season. And while Sanchez is the top-scorer for Arsenal with 8 goals already in just 11 appearances for the Gunners, Hazard is sitting on the bronze position as he has just nudged the ball 3 times past the opponent keeper. While Hazard has a bouquet of world class running left, right and forward in his Chelsea team with players like Cesc Fabregas and Diego Costa being the new and valuable additions to an already star-studded Chelsea firing force, Sanchez is still finding his foot at the English land, however, he has shown no complacency for it. In the absence of Olivier Giroud and being a partner of Danny Welbeck in attack who is another new-comer, Sanchez has really blossomed the Emirates stadium with his consistent performances. So even though Hazard is not at his best form but the Chilean is enjoying all sorts of success in his first season at the Emirates. It would still be unwise not to praise Sanchez who has just set his foot in the English League.